I am a big believer that it is all about perspective…What eyes are you looking through? I will begin by telling you about what happened on my “Bad Day”. I woke up late and had to rush out the door to teach a morning yoga class at a studio that is about 30 minutes from my house. I have the keys, so no one can get in until I am there to unlock the studio. 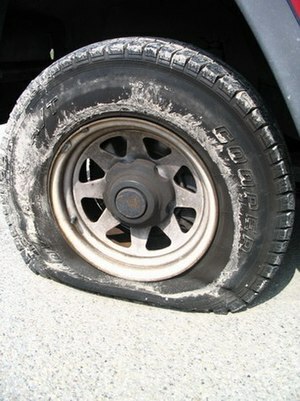 I start driving and get about 20 minutes down the road and dun dun dun….my tire shreds on the highway. This is no 40 mile an hour highway we’re talking….this is US 19 which is a 60 mile an hour 5 lanes on each side highway… I pull off and realize I can’t call anyone for help because my phone is dead. I can’t change my tire because my spare on the back end has a puncture in it…I miss my class obviously and I am stranded away from my home. Also, my boyfriend started his new job that week so there was no calling him for help. I am realizing I know no one’s number without my cell phone and all I keep picturing is my poor students waiting outside the studio with their mats wondering why I did not show… I realized I could do one of two things…cry and scream and probably fall asleep in my car like an exhausted baby after a temper tantrum, or I could keep my head on straight and handle the situation with the lightest spirit possible. I walked to the grocery store and went to customer service hoping someone had a charger. Luckily a young girl was working and allowed me to plug my phone into her charger in the back. I was already feeling better. The fact that she could have turned me away and didn’t made me smile. As I waited for my phone I read the newspaper and bought a salad to eat. I sat and enjoyed my food and the time to myself that I never would have got if I had been running around all day from class to my errands ect… My phone charged and I called my friend Jackie who lives fairly close. She was able to come get me and I actually got to spend some time with her and her daughter that I may not have seen for another couple weeks otherwise. She brought me to my boyfriends work and I went to page him on the fourth floor…no response. The woman explained that since he is new his account and phone may not be set up and due to security I cannot go upstairs…What do I do now? The lady asked what had happened and as I was explaining a friend of mine that works in the building happened to walk into the lobby! She was more than happy to go find Alex and get his keys for me. I thought I would have to wait until his lunch break and hope he came downstairs. I drove to my old work to see if my friend was working who may know where I could get a cheap tire, not only did he help me but he bought my lunch unexpectedly. I went to pay and it was “already taken care of”. My friend Alicia was working so she told me if I wanted to wait she would come with me to help me with the tire. We had to drive back to my car, get the rim, and bring it to the guy to put a new “used” tire on the rim. Then back to the car to actually change the tire. I could tell it was going to be a tedious process…especially because the distance between my car and these places was about 30 minutes each way. I ended up having a blast… I got to spend some great time with my girl. We acted a fool in auto zone have a “sword fight” with the tire iron I had to buy…I am pretty sure the guys in their thought we were on something, but I must say being silly and acting a fool felt much better than having a mental break down (me if I was me 2 years ago and this same situation happened). We ran around like crazy, got my tire changed, and I made it home just in time for bed…It was a crazy, exhausting day. However, I wouldn’t have changed it for the world. also I don’t know if kaycie told you, but I am in the process of moving to Tampa! I’d love to meet you. I’ll be there this weekend to get the keys to my new place and then back again officially on July 1st! There are so many things that gave you joy and peace that day that you wouldn’t have given yourself, so the universe said, “here ya go!” Haha. I love this story. This is going to improve my day ten fold! Love you Sara!!! Lovely! What happened to the students though? !